Mirth and magic (and maybe a modicum of mayhem) as a melee of Morris maids and men and minstrels make merry and music in support of the Croydon Neighbourhood Care Association. 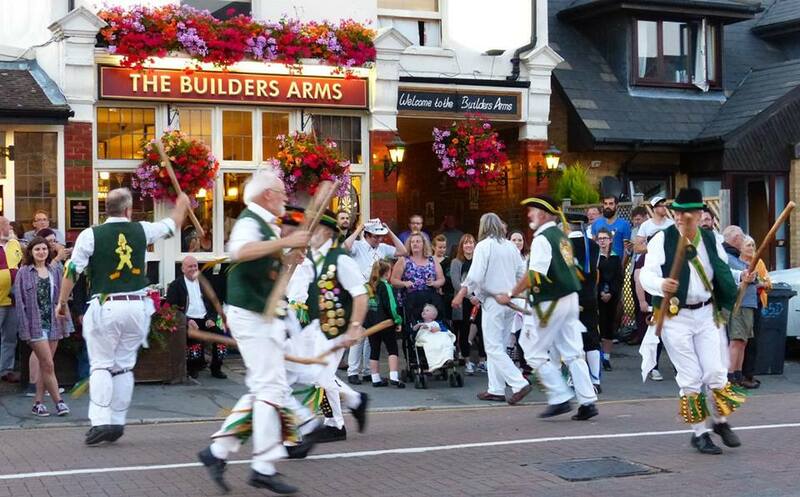 Croydon’s resident dancers – the Wild Hunt Bedlam (does what it says on the tin), Old Palace Clog and the North Wood Morris – will be entertaining you along with a dozen visiting troupes dancing a variety of styles. The main venue is in Lesley Park Road outside the Builders Arms in Addiscombe (postcode CR06TP) but there will also be dancing at the nearby Oval Tavern in Oval Road (CR06BR) and the Orchard in Cherry Orchard Road (CR0 6BA). All the venues are within 10 minutes of East Croydon station and Lebanon Road tramstop. Buses 197, 289, 312, 367 and 410 all stop close by; 119, 194, 198 and 466 stop a little further away at the aforementioned Lebanon Road tramstop. Come on down and join the fun. No admission charge! Bells will be a-jangling from 7 o’clock. The schedule is not yet published though North Wood will be dancing at the Builders Arms. Otherwise just listen for the sound of music and merriment. Children welcome (indeed vital for the out of season Maypole!) and we look forward to seeing you. The Oval will be serving their wonderful food and running a barbecue. There will be food at the other venues as well. More on Facebook – and please share and also invite anybody who might be interested. Xmas Day of Dance, December 9th 2017.